Was Rear Admiral Ralph O. Davis mistaken for Major General Rapp Brush by Lieutenant Toshimi Kumai? Who's the American Major-General that Lt. Toshimi Kumai saw? MAJ. GENERAL RAPP BRUSH BY LT. KUMAI? Japan surrendered on August 15, 1945. To disseminate this news to the 1,800 Japanese soldiers in Panay, liaison planes dropped information phamplets throughout the island stipulating that surrender panels be displayed by all units. On August 24 or 25, 1945, an American observation plane, which appeared to be looking for the Japanese, flew over Bucari, Leon. The Japanese unit in Bukari reacted by spreading a signalling panel, and then tried to send signals to the plane. On August 28 (according to the Americans), the Japanese representatives came down from Bocari to Daja Dam Site, Maasin. They were then transported to the plaza of Maasin. The manner of surrendering was discussed, and the resulting agreement was typed by T/4 Robert A. Way, secretary to the commanding officer of the 160th U.S. Infantry. It was then signed by Colonel Raymond G. Stanton (commanding officer of the 160th Infantry Regiment) for the Americans, and Captain Kaneyoki Koike (the Kempei Tai commander in Panay) for the Japanese. There's just one problem with the last part, regarding the presence of Maj. Gen. Brush. First, Maj. Gen. Rapp Brush was replaced by Brig. Gen. Donald Myers the month before, in July, 1945, as the commanding officer of the 40th Infantry Division. So Brush couldn't have been there any longer, especially in late August. Secondly, from his file photo, Maj. Gen. Rapp Brush didn't appear to be young-looking as Lieut. Kumai would describe him to be. So who was the American major-general that Lieut. Kumai saw? Myers was only a one-star brig. general, not a two-star major general. And he looked old too anyway. So it couldn't have been Myers. Brig. Gen. Robert O. Shoe, the assistant commander of the 40th Infantry Division, was likewise only a one-star officer. If there was a two-star American officer who could be young looking, that would be Rear Admiral Ralph O. Davis. But Davis' ship, the USS Estes, did not arrive in Iloilo until the afternoon of September 1, 1945. Which means that Davis too couldn't have been in Maasin the previous month. So, again, who was the American major-general that Lieut. Kumai saw? Perhaps the answer to this puzzle lies not in the surrender negotiations in Maasin but in the surrender signing ceremony in Cabatuan Airfield on September 2 when Col. Tozuka signed the surrender instrument. 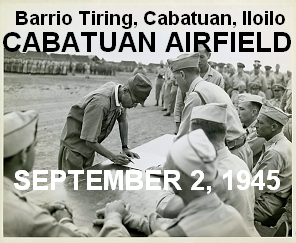 Photos show that while Col. Ryoichi Tozuka was signing the surrender instrument in Cabatuan Airfield on September 2, 1945, both Brig. Gen. Myers and Rear Admiral Davis were in the background, sitting on the leftmost chairs, with the other officers to the right. Did the sudden appearance of a two-star officer actually happen in Cabatuan and not in Maasin? After the surrender instrument was signed by Col. Tozuka, Myers and Davis stood up, resulting in the "ten-hut." 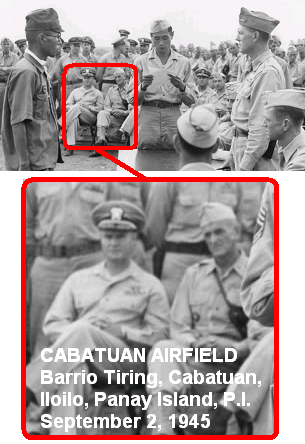 And then, the Japanese-American interpreter Moffet Mitsuo Ishikawa (also in the photos) could have referred to Brig. Gen. Myers as the commanding officer of the 40th Infantry Division. Since Kumai was in the mountains until the day before, he may not have known that Maj. Gen. Rapp Brush was already replaced by Brig. Gen. Donald Myers. And seeing a two-star insignia on Rear Admiral Ralph O. Davis, Kumai may have assumed Davis to be Brush. A highly probable scenario actually considering that Davis had a young-looking face, and a two-star to boot.